The America the Beautiful coin series was introduced in 2010 to celebrate the nation’s national forests, parks, monuments, and cultural landmarks. The 12th coin in the series was released in 2012, and honors the Chaco Culture of New Mexico. 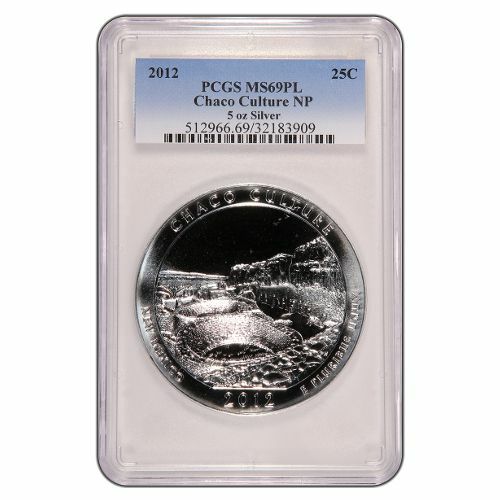 Today, you can purchase a 2012 5 oz Chaco Culture ATB Silver Coin from Silver.com. Just 734 coins available in this grade and condition! Consists of five ounces of .999 fine silver. Bears a face value of $.25 (USD) backed by the federal government. Graded MS69 by the Professional Coin Grading Service. Available with a proof-like finish. Ships in a PCGS plastic slab to protect the coin’s condition. Chaco Canyon was listed as a national site by the US government on March 11, 1907. The canyon itself was created by an ancient stream in the Chaco Wash, and served as the epicenter of Native American culture in the American Southwest from 850 AD to 1150 AD. Although it is closely associated with Pueblo culture, the area served as a cultural bridge between Hopi, Navajo, and Pueblo nations living in the American Southwest. The 2012 5 oz Chaco Culture ATB Silver Coin is the second coin released during the 2012 production cycle. Each year, the United States Mint releases five new designs in the America the Beautiful series. The program will eventually highlight a monument, park, or forest from each of the 50 states, the nation’s five territories, and the District of Columbia. On the reverse side of the coin you’ll find the image of elevated kivas, or houses, that make up the ancient ruins of the Chaco Culture. The walls of Chaco Canyon are visible on one side, with the Chetro Ketl Great House walls visible on the other. The obverse features a left-profile bust of President George Washington. This image originated from a sculpture created in 1786 by William Cousins, and was refined for use on American quarters in 1932. Each coin available to you in this Silver.com product listing is in near-perfect condition. The proof-like finish on these coins is rare for a bullion product, and adds value to the coin itself. You’ll find no more than two minor detracting flaws on these Mint State 69 coins. If you have questions for a Silver.com associate, please call us at 888-989-7223, chat with us online, or send us an email. Looking for similar products? 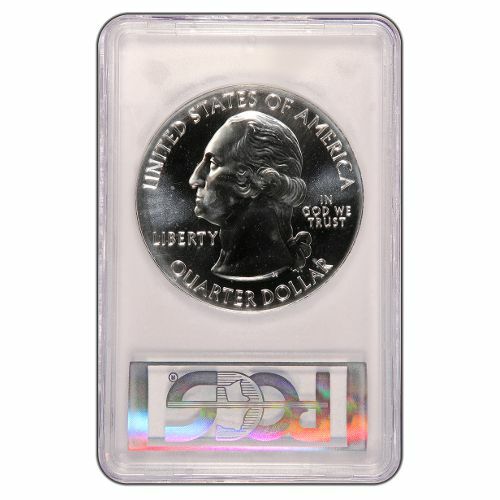 Be sure to see our full selection of Certified Silver Coins.